We are an intimate, chef-owned restaurant located in the downtown Berea. Open for lunch and dinner seven days a week, we offer fine Thai cuisine featuring the finest South East seasonal ingredients. Our chef Den cooking approach unites his classic training in some of the most celebrated kitchens in Boston with his passion for freshness and simplicity. When dining at SweetMangoBerea you can choose from our current memu, the finest of what we offer from appetizer through dessert, at a single fixed price. SweetMangoBerea menus are designed to pair beautifully with your wine selection from our wine list. We also offer vegetarian and vegan options on request. We are proud to be voted for the 2008 Cleveland HotList Winner. We say it's cozy and relaxed. 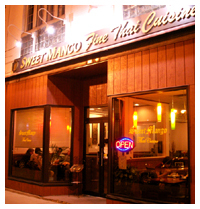 While nobody at SweetMangoBerea is going to rush you, or over explain the menu, getting advice when selecting from our menu list or finding out which dessert is our favorite is just the kind of information our friendly and informed wait staff are there to help you with.